Just where exactly has Thor been? 2015’s Avengers: Age of Ultron was the last significant appearance of Thor Odinson (not including the brief mid-credit cameo after Doctor Strange). There’s been five MCU movies since Ultron, including the all-but-titled Avengers flick that was Captain America: Civil War, which left fans everywhere wondering “Where is Thor? !” Well, that question is answered almost immediately as the god of thunder returns to the spotlight in Thor: Ragnarok. The film begins with Thor suspended high in the air in an old cage, explaining to the audience how he got there and where he’s been. When we left Thor (Chris Hemsworth) and his mischievous brother Loki (Tom Hiddleston) in The Dark World, we found Loki impersonating their father, Odin, as the ruler of Asgard in the final minutes and Thor believing Loki to be dead. Anthony Hopkins returns as Odin and seems to be having fun with the role by not only playing the Odin that we’ve come to know, but also having to portray Loki’s version of Odin as well. Loki’s ruse is discovered by Thor rather quickly (and in a very humorous sequence, I might add), and it becomes the catalyst to a chain of events that ultimately introduces Cate Blanchett to the franchise as Hela, the goddess of Death, and she wants nothing more than to rule Asgard herself. Although she’s used for exposition a majority of the movie, Blanchett is wickedly evil and fantastic as ever behind her wonderful costume design and makes her powerful presence quickly known as someone not to be challenged. After a brief squabble with our heroes (yes, I’m including that trickster Loki in that category as more of an anti-hero than a villain nowadays), they’re all three split up within the bifrost. Hela makes her claim on the throne of Asgard after an incredible action piece consisting of her and her reluctant recruit Skurge (Karl Urban) against the entire Asgardian army. 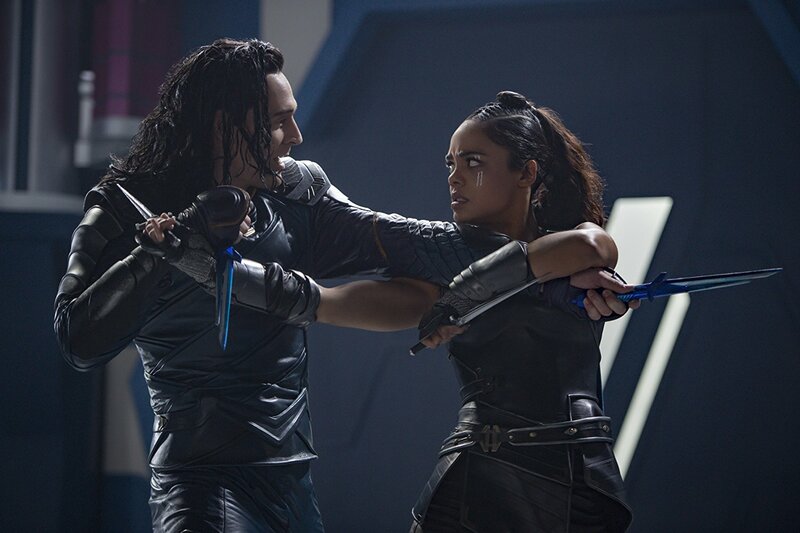 Meanwhile, our hero ends up in what appears to be a massive junkyard called Sakaar and is captured by a junker named Valkyrie (Tessa Thompson). 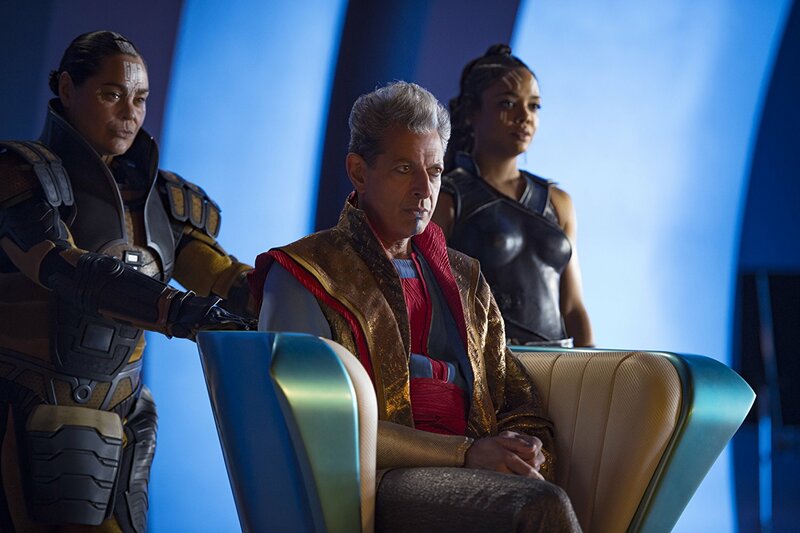 Sakaar is ran by an eccentric leader, aptly named Grandmaster, and is played by none other than Jeff Goldblum. I found his character to be amusing at first in a typical Goldblum way, but as time passed, he became more and more generic to me and unthreatening, much like I found the Sovereign in Guardians of the Galaxy Vol 2 earlier this summer – just a mild annoyance to our protagonist while the big bad is gaining power before the final showdown. The more time spent on Sakaar, the less invested I found myself becoming in the film. The real threat (and much more interesting antagonist) is back home on Asgard, but our hero is trapped with seemingly no way out of Sakaar. In fact, the only way to get out was to defeat the Grandmaster’s champion in a Colosseum battle – whom you may or may not know from the marketing of this film as the Incredible Hulk (Mark Ruffalo). 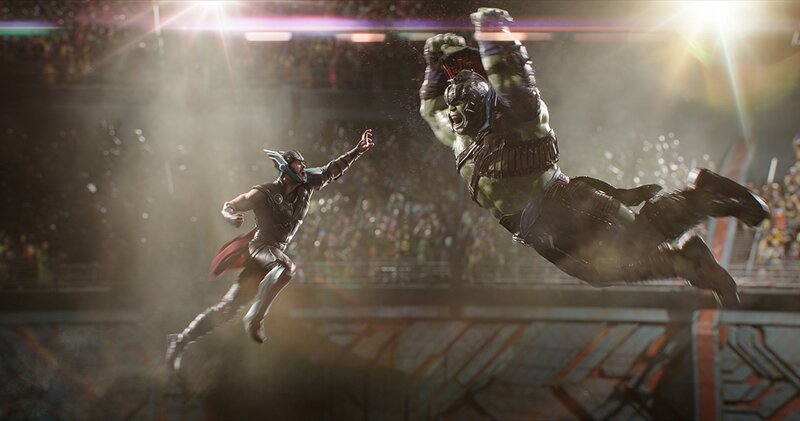 The reunion of Thor and Hulk was Incredible (pun intended) in itself and will not disappoint the viewers. In fact, I think the action pieces throughout the entire film are all adrenaline pumping, jaw-dropping moments that will please any action movie fan – especially with the inclusion of Led Zeppelin’s Immigrant Song that was plastered all over the trailers. The only real action beat that stands out to me as one I didn’t like was in the final act. I’d spent the entire movie waiting for the final showdown between Thor and Hela and as they beginning charging toward one another ready to strike, Waititi decides to make a hard cut to Heimdall (Idris Elba) on the other side of Asgard which left me kind of stunned. Ragnarok is a lot of fun – a lot more fun than it’s predecessor and I walked out thinking it’s easily the best of the three Thor films. Waititi did a fantastic job bringing out the humor in this addition and sort of re-invigorating the Thor franchise. It was clear to me from the previews that Ragnarok was going to be heavily influenced by Guardians of the Galaxy aesthetically, which is fine and holds true – although like Guardians 2, I felt at times that this film tried too hard to be risque or edgy in some of the dialogue when it didn’t need to be. I never expected to hear about orgies in a Disney/Marvel film, but Thor: Ragnarok surprised me by doing just that. In the end, I found Thor: Ragnarok in it’s entirety to be a welcomed addition to the franchise and a breath of fresh air after the not-so-stellar Dark World. I’m not certain we’ll ever see Natalie Portman reprise her role as Jane Foster ever again, as once again she’s only merely mentioned in an off-hand comment during Thor’s brief few minutes on Earth. In contrast though, Waititi does introduce a number of great new characters (including Kurg, whom he voices himself) that keeps the movie fresh and entertaining to watch and will leave the audience eager for what he and the rest of Disney/Marvel have to come.